For over hundreds of years, it is the Chinese’s tradition to celebrate the Mid-Autumn Festival, to be gathered under the full moon once a year with family and friends, a symbol of Reunion. With such tradition and folklore, the Moon has always been the main focus during Mid-Autumn Festival as it become brighter, bigger in size and a perfect circle during the Full Moon Phase. Our concept is to bring the distanced Moon closer to the surface of Victoria Park, which gives the visitors a dynamic visual impact, a Synthetic Moon. In recent years, our society becomes more aware of the term Sustainability, on different aspects of our living environment such as foods, shelters and transportations. As a temporary pavilion, we would propose using sustainable materials which is recyclable after deconstruction or even using recycle material for construction directly, to promote Hong Kong as a sustainable city. Each year, there are thousands of polycarbonate water bottles distributed and the amount of consumption is still increasing. The polycarbonate water bottles will be recollected by distributer for reuse after distillation. This sparks our concept on our proposal for this year’s Lantern Wonderland 2013, to achieve a sustainable design. While we celebrate such meaningful tradition of ours, we might as well think about what can be done so that our future generation will grow up in a healthier environment. 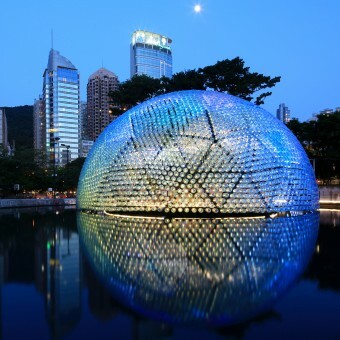 Rising Moon is a temporary pavilion designed to serve as an anchor attraction during the 2013 Hong Kong Mid-Autumn Festival. It re-interpret traditional paper lanterns with recycled plastic bottles on the same time creating a Synthetic Moon, thus promoting the message of environmental protection. Rising Moon offered strong visual impact with sound and lighting effects externally and internally. 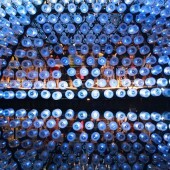 The design received the Gold Award at the Lantern Wonderland Design Competition. This Pavilion is build for Hong Kong Mid-Autumn Festival Lantern Wonderland 2013 , held in Victoria Park from 14 September 2013 to 22 September 2013. We proposed to reuse the 5 gallons polycarbonate water bottles as a representation of the traditional Chinese Paper Lanterns. The outer dome surface of the moon was wrapped around with water bottles, in which they are transparent with variation of colours also creating an interesting texture. 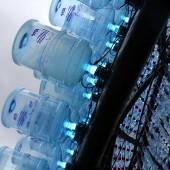 Each water bottle was connected with a Light Emitting Diode (LED) device and each LED is controlled by computer to generate different lighting effects on the moon surface. LED are low energy consumption and reusable. One of the highlight of the lighting effects was the performance of the Moon Phases, from the New Moon to Full Moon. The Rising Moon was sitting on top of reflective pool. This was to allow the Moon to have a complete sphere visually on the outside, having the other half appearing on the pool as a reflection. In order to arouse the public awareness of the damage made to our city by those bottles, we have included a lighting installation hang from the ceiling as to mimic the tradition of hanging paper lanterns under the eaves. 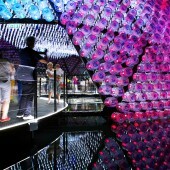 Once the installation has completed, a sea of bottle lanterns with LED will appear inside the pavilion. This will give a strong visual impact to the visitor as they enter, and draw the attention towards the opening. - “Rising Moon” is three stories high, measuring approximately 10 meters in height and 20 meters in diameter. - The entire lantern is made from recyclable and reusable materials, including approximately 7,000 recycled plastic bottles (4,848 5-gallon bottles and 2,300 1.5-liter bottles), steel frames, cable wires and energy-saving LED lights. The plastic bottles will be recycled after the display. - The hemispheric structure consists of 148 triangular steel components, each crossed with cable wires to form a cable net. LED lights tied to plastic bottles are secured to the cable net in each triangular steel frame, forming the surface of the lantern. - The giant lantern sits in a pool, and with lighting effects, it joins its reflection, imitating the moon phases, forming a “full moon” at one point. - Visitors and local residents can walk inside the structure from its sides to appreciate the design of the interior, which is filled with suspended lanterns made from recycled plastic bottles. Spectators can view the full moon through the lantern’s dormer. The lantern interior can accommodate a maximum of 100 persons at a time. 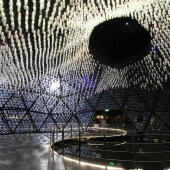 Rising Moon Pavilion by Daydreamers Design is a Nominee in Architecture, Building and Structure Design Category. · Click here to register today inorder to be able to view the profile and other works by Daydreamers Design when results are announced. Rising Moon Pavilion by Daydreamers Design is Winner in Architecture, Building and Structure Design Category, 2013 - 2014. · Read the interview with designer Daydreamers Design for design Rising Moon here. 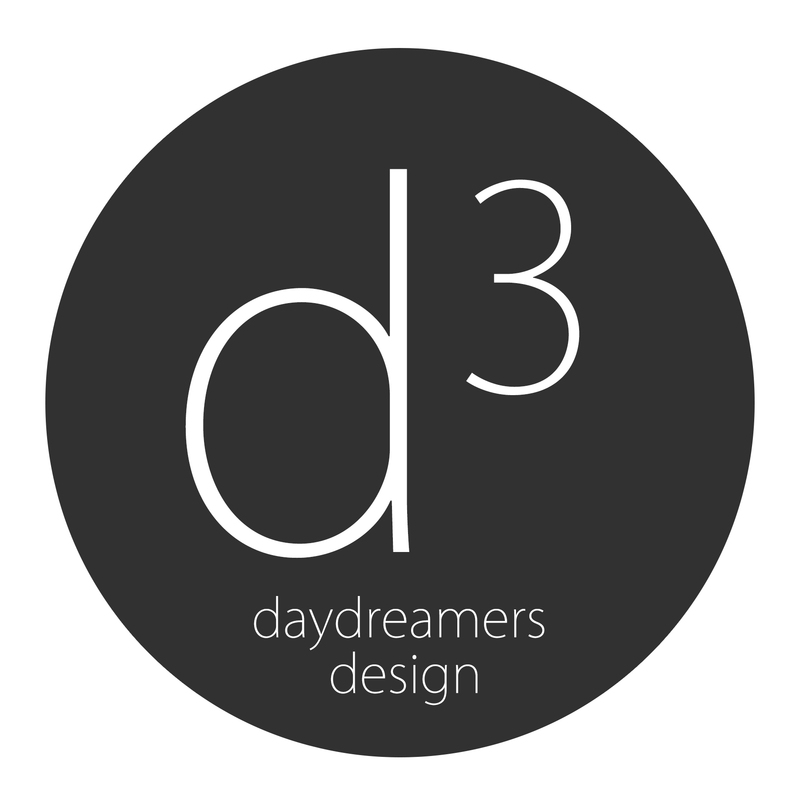 · Press Members: Login or Register to request an exclusive interview with Daydreamers Design. · Click here to register inorder to view the profile and other works by Daydreamers Design. Did you like Daydreamers Design's Architecture Design? Did you like Rising Moon Pavilion? Help us create a global awareness for good architecture design worldwide. Show your support for Daydreamers Design, the creator of great architecture design by gifting them a nomination ticket so that we could promote more of their great architecture designs.